This was an impressive event, attended by a large number of senior executives and staff from Network Rail, Northern Rail and Trans Pennine Express and by elected members of Transport for Greater Manchester and Salford City Council. There was even a senior representative of the Lancashire Eccles Cake Company in attendance! He had provided two thousand Eccles Cakes which had been distributed to commuters earlier in the day at Piccadilly and Victoria, together with postcards summarising the "Electrifying News" that the first phase of the North West electrification programme had now been completed. Jane Simpson, Director of Route Asset Management at Network Rail - and, appropriately, a qualified electrical engineer - opened the day from a temporary dais on the platform and welcomed the Secretary of State for Transport and around 50 guests who had travelled to Eccles on the local train from Victoria. Then, quite unexpectedly, Freccles moved from supporting cast to centre stage when, first Lee Wasnidge, Area Director, Northern Rail and then Ian Stewart, City Mayor, made reference to our work at the station. 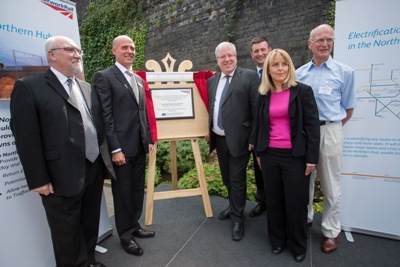 The Secretary of State for Transport (Rt Hon Patrick McLoughlin MP) similarly praised Freccles by name before he unveiled the plaque, temporarily housed on an easel. (We are told that the plaque will be secured to the station wall in the future.) Finally, we were invited to join the chief guests on the dais for photographs! It was a glorious summer's day and our gardens provided the ideal background to the ceremony - something which had clearly been realised by those at Network Rail who were responsible for hosting the event. Emboldened by our endorsement by the Secretary of State, members of Freccles seized the opportunity to lobby extensively; we got our message across in an interview with BBC Radio 4 NW about the strategic importance of Eccles station and, in another interview with Salford OnLine , we emphasised the need for a more frequent train service. The Chair of TfGM was particularly interested in one of Freccles chief objectives - to promote Eccles as a significant rail / bus / Metrolink interchange and promised to pursue this at the highest level. We emphasised that, even without any promotion, 20% of commuters who use Eccles station are going to Media City. Surely, we said, with proper marketing and a good train service, this sensible use of Eccles as an interchange will increase significantly and take a little strain off central Manchester stations. We even had a senior executive from Trans Pennine Express admitting that there was logic in our objective to make Eccles the "Stockport of the west" and that his Scottish trains should stop here just as Virgin stop their London trains at Stockport. The evidence that Alliance Rail thought there was a business case for stopping their proposed West Yorkshire to London trains at Eccles did seem to have an impact. It was abundantly clear that without the work that all the members of Freccles have put in to the gardens and the station in general over the years Network Rail would not have chosen Eccles for the unveiling ceremony. So, it was a great day for Freccles - and for Eccles. Can we expect "Electrifying Eccles" to be the next headline, and will we get more trains and more Eccles Cakes?